Jusuf Nurkic is a professional Basketball player of Bosnian descent who currently plays as a centre for the Portland Trail Blazers of the NBA. He also plays for the Bosnian national team. In 2014, he was nominated for the FIBA Europe young player of the year award. His position as a centre player for the Trail Blazers has also earned him the nickname “beast” or “Bosnian best”. Nurkic was born in Tuzla which happens to be the third largest city in Bosnia and Herzegovina on the 23rd day of August 1994. His height, even as a growing child, has always been something that spotted him out in a crowd. At the age of fourteen, Bosnian agent Ene Trnovcevic singled him out and offered him the opportunity to play for Zlatorog Laško (a Slovenian youth basketball club). Prior to this time, Jusuf Nurkic had never played basketball and could hardly shoot a ball but he was interested in the game and was equally willing to learn, thus, he was assigned to a personal coach who taught him the basics of the game. He learnt so fast and played the game very well. Not quite long, he was loaned to Union Olimpija and joined them to play at the Nike International Junior Tournament. He performed more than expected at the tournament and caught the attention of scouts, especially from the international communities. After the tournament, Jusuf didn’t return to Zlatorog Laško, accusing his coach of not giving him enough playing time, he left the team in October 2012 and would sign a 4-year contract with Croatian club Cedevita. He still didn’t get enough playing time in his first season with the team. During the Euroleague, he played in just six games, with an average of 1.8 points per game. Early 2013, he was loaned to another Croatian basketball team Zadar where he spent the rest of the season. His breakthrough came under coach Jasmin Repeša, he played in the regional Adriatic League, recording an average of 5.6 rebounds and 11.6 points per game. The following year (2014), he was nominated for the FIBA Europe young player of the year award. In 2014, Jusuf Nurkic was selected sixteenth overall by the Chicago Bulls. However, he never played a single game for the Bulls as they traded him to the Denver Nuggets on the night of the draft. In July of the same month, he signed his rookie scale contract with them. His first NBA appearance was in a game against the Detroit Pistons which ended in an 89–79 win. In that game, Nurkic recorded five points and seven rebounds. He remained with the team till February 2017, when he was traded to Portland Trail Blazers in exchange for Mason Plumlee, a cash consideration and a 2018 second round pick. In March 2017, he recorded a career-high of twenty-eight points and twenty rebounds in a game against the Philadelphia 76ers. He also made eight assists and six blocks to become the first NBA star, after Charles Barkley (1986), to record such in a single game. He renewed his contract with the franchise in July 2018 and has remained with the team till date. Jusuf also plays internationally for the Bosnia and Herzegovina national team. In 2012, he was named the MVP of the FIBA Europe Under-18 Championship and for the Under 20 Championship in 2014. Jusuf is the son of a Bosnian and Herzegovina police officer, Hariz Nurkić. Hariz has a staggering and an intimidating height that there is hardly anyone who doesn’t know him in the city. It was once reported in a Bosnian Newspaper that Hariz Nurkic beat up 14 persons in a fight, considering his big stature and his position as an officer of the law, this might be true. 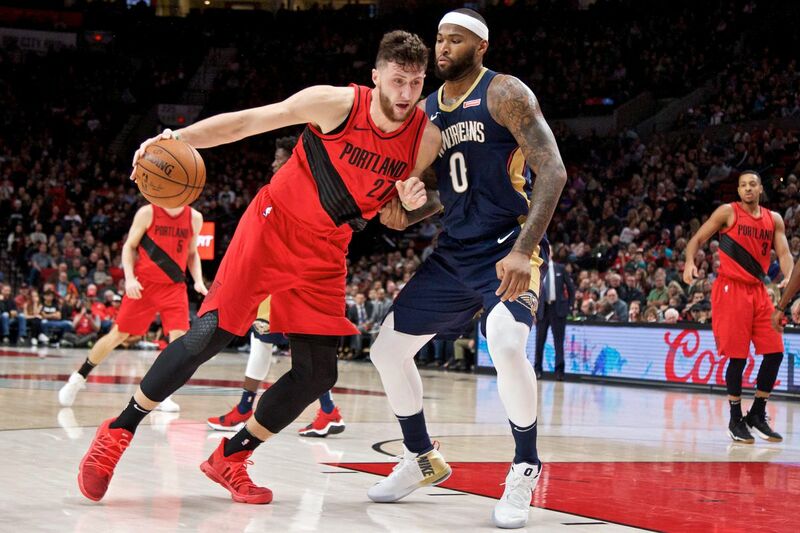 According to the Bosnian sports agent who discovered Jusuf Nurkic, he got interested in the younger Nurkic after meeting his father, he concluded that his son would also be very tall and fit into the game of basketball and he wasn’t wrong. Hariz has been pictured a number of times attending his son’s game. Jusuf has a brother named Kenan Nurkić. The Portland Trail Blazers’ centre is currently dating a lady named Emina Duric. Emina is also from Tuzla, the same city and hometown as her boyfriend. It’s not certain how long the duo has been together but the stunning lady is very protective of her boyfriend. She once made him wear a T.shirt with her photo on it and with the inscription: “If you can read this you’re too close, he has a girlfriend.” Nurkic, of course, got backlashed on social media for wearing the shirt, interestingly, that didn’t get to the NBA star who is obviously in love. The Bosnian beast as he is also popularly known and addressed has such stunning and intimidating height that you can’t help but notice. Standing at a height of 7ft 0 in (2.11m), he is obviously one of the tallest in the NBA. He has a body weight of 280 pounds (127 kg) and a wingspan that measures 2.18 m. For someone of his stature, he has this great moving agility with his powerful frame, great hands and superb mobility, it all serves up as a huge threat to every team opponent he encounters also with his leaping ability and quick feet, it is a whole lot of quality for a player of his sizes to posses.